The Latin word basilica (derived from Greek : βασιλική στοά , Royal Stoa , the tribunal chamber of a king) has three distinct applications in modern English. Originally, the word was used to refer to an ancient Roman public building, where courts were held, as well as serving other official and public functions. It usually had the door at one end and a slightly raised platform and an apse at the other, where the magistrate or other officials were seated. The basilica was centrally located in every Roman town, usually adjacent to the main forum. Subsequently, the basilica was not built near a forum but adjacent to a palace and was known as a "palace basilica". Stoa Basileios, meaning Royal Stoa, was a stoa constructed in Ancient Athens in the 6th century BC and substantially altered in the 5th century BC. It was located in the northwest corner of the Athenian Agora. The nave is the central part of a church, stretching from the main entrance or rear wall, to the transepts, or in a church without transepts, to the chancel. When a church contains side aisles, as in a basilica-type building, the strict definition of the term "nave" is restricted to the central aisle. In a broader, more colloquial sense, the nave includes all areas available for the lay worshippers, including the side-aisles and transepts. Either way, the nave is distinct from the area reserved for the choir and clergy. A minor basilica is a Catholic church building that has been granted the title of basilica by the Holy See or immemorial custom. Presently, the authorising decree is granted by the Pope through the Congregation for Divine Worship and the Discipline of the Sacraments. Christianity has a strong tradition of pilgrimages, both to sites relevant to the New Testament narrative and to sites associated with later saints or miracles. The Basilica of Our Lady of Guadalupe is a Roman Catholic church, basilica, and National shrine of Mexico in the north of Mexico City which houses the cloak containing the image of Our Lady of Guadalupe. The 1709 shrine was built near the hill of Tepeyac, where the Virgin Mary is believed to have appeared to Saint Juan Diego Cuauhtlatoatzin. The basilica structure which now contains Diego's cloak was completed in 1974. The Basilica Ulpia was an ancient Roman civic building located in the Forum of Trajan. The Basilica Ulpia separates the temple from the main courtyard in the Forum of Trajan with the Trajan's Column to the northwest. 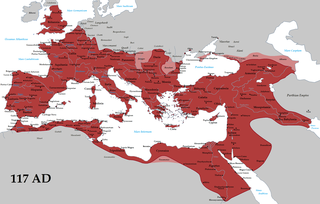 It was named after Roman emperor Trajan whose full name was Marcus Ulpius Traianus. There were several variations of the basic plan of the secular basilica, always some kind of rectangular hall, but the one usually followed for churches had a central nave with one aisle at each side and an apse at one end opposite to the main door at the other end. In (and often also in front of) the apse was a raised platform, where the altar was placed, and from where the clergy officiated. In secular building this plan was more typically used for the smaller audience halls of the emperors, governors, and the very rich than for the great public basilicas functioning as law courts and other public purposes. 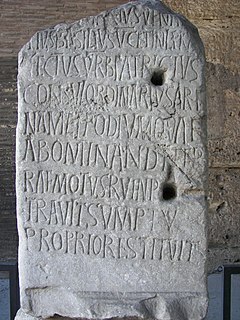 Constantine built a basilica of this type in his palace complex at Trier, later very easily adopted for use as a church. It is a long rectangle two storeys high, with ranks of arch-headed windows one above the other, without aisles (there was no mercantile exchange in this imperial basilica) and, at the far end beyond a huge arch, the apse in which Constantine held state. In Romania, the word for church both as a building and as an institution is biserică , derived from the term basilica. The privileges attached to the status of minor basilica, which is conferred by papal brief, include a certain precedence before other churches, the right of the conopaeum (a baldachin resembling an umbrella; also called umbraculum, ombrellino, papilio, sinicchio, etc.) and the bell ( tintinnabulum ), which are carried side by side in procession at the head of the clergy on state occasions, and the cappa magna which is worn by the canons or secular members of the collegiate chapter when assisting at the Divine Office. In the case of major basilicas these umbraculae are made of cloth of gold and red velvet, while those of minor basilicas are made of yellow and red silk—the colours traditionally associated with both the Papal See and the city of Rome. The description "patriarchal" still applies to two minor basilicas  associated with archbishops who have the title of patriarch: the Patriarchal Cathedral Basilica of St Mark in Venice and the Patriarchal Basilica of Aquileia. ↑ "Basilicas in the World". G Catholic. Retrieved 16 November 2017. 1 2 3 "Eternal Word Television Network, Global Catholic Network". Ewtn.com. 1999-06-13. Retrieved 2012-02-17. 1 2 "Zenith News December 14, 2009". Zenit.org. Archived from the original on 13 November 2011. Retrieved 17 February 2012. ↑ "The Institute for Sacred Architecture - Articles - The Eschatological Dimension of Church Architecture". www.sacredarchitecture.org. ↑ "Basilica Plan Churches". Cartage.org.lb. Archived from the original on 12 January 2012. Retrieved 17 February 2012. 1 2 Gietmann, G. (1913). "Basilica" . In Herbermann, Charles. Catholic Encyclopedia . New York: Robert Appleton Company. 1 2 The title of minor basilicas was first attributed to the church of San Nicola di Tolentino in 1783. 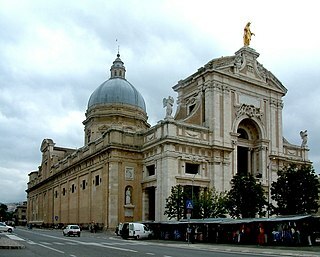 Older minor basilicas are referred to as "immemorial basilica". ↑ Gcatholic.org (4 March 2013). "Basilicas in the World". Archived from the original on 4 March 2013. Retrieved 12 November 2017. Gietmann, G. (1913). "Basilica" . In Herbermann, Charles. Catholic Encyclopedia . New York: Robert Appleton Company. A transept is a transverse part of any building, which lies across the main body of the edifice. 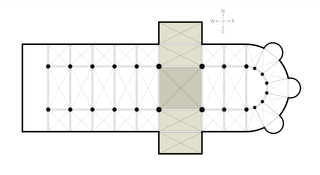 In churches, a transept is an area set crosswise to the nave in a cruciform ("cross-shaped") building within the Romanesque and Gothic Christian church architectural traditions. Each half of a transept is known as a semitransept. Lateran and Laterano are the shared names of several buildings in Rome. The properties were once owned by the Lateranus family of the Roman Empire. The Laterani lost their properties to Emperor Constantine who gave them to the Roman Catholic Church in 311. 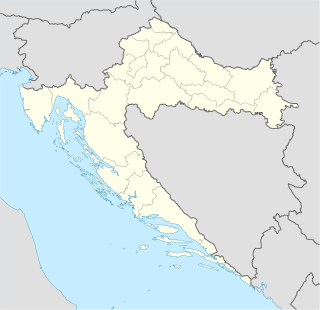 The Euphrasian Basilica or the Cathedral Basilica of the Assumption of Mary is a Roman Catholic basilica in Poreč, Croatia. The episcopal complex, including, apart the basilica itself, a sacristy, a baptistery and the bell tower of the nearby archbishop's palace, is an excellent example of early Byzantine architecture in the Mediterranean region. Santa Pudenziana is a church of Rome, a basilica built in the 4th-century, that is dedicated to Saint Pudentiana, sister of Saint Praxedis and daughter of Saint Pudens. It is a national church for Filipinos and is therefore one of the national churches in Rome. The Basilica of Saint Mary of the Angels is a Papal minor basilica situated in the plain at the foot of the hill of Assisi, Italy, in the frazione of Santa Maria degli Angeli. The Basilica of Maxentius and Constantine, sometimes known as the Basilica Nova—meaning "new basilica"—or Basilica of Maxentius, is an ancient building in the Roman Forum, Rome, Italy. It was the largest building in the Forum. A tetraconch, from the Greek for "four shells", is a building, usually a church or other religious building, with four apses, one in each direction, usually of equal size. The basic ground plan of the building is therefore a Greek cross. 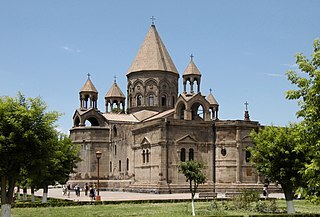 They are most common in Byzantine, and related schools such as Armenian and Georgian architecture. It has been argued that they were developed in these areas or Syria, and the issue is a matter of contention between the two nations in the Caucasus. Apart from churches, the form is suitable for a mausoleum or baptistery. Normally, there will be a higher central dome over the central space.